Graphic recording–a method of real-time visual note taking–is a specialized field requiring a diverse skillset. 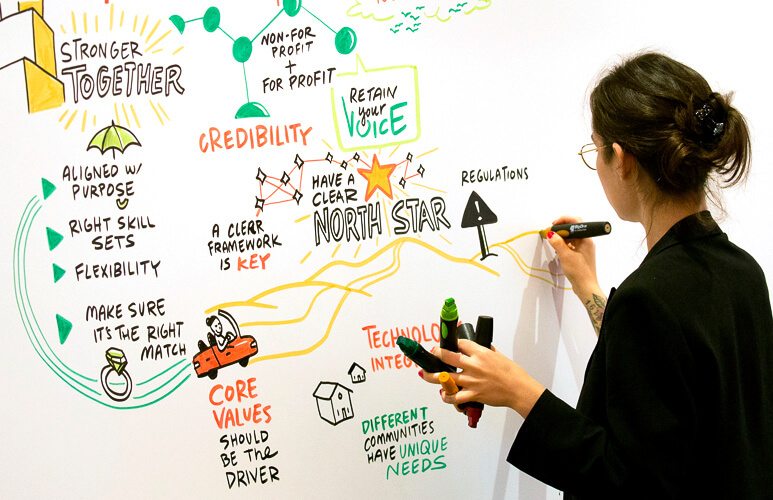 Graphic recording–a method of real-time visual note-taking–is a highly specialized skill. While there is no official certification for graphic recording, at ImageThink we have funneled over a decade’s worth of experience into a comprehensive, immersive training program for our new graphic recorders before they ever hit the conference room floor. Over a period of three months, our newest team members practice in studio, get feedback from our team, and shadow senior graphic facilitators at corporate events in the field. 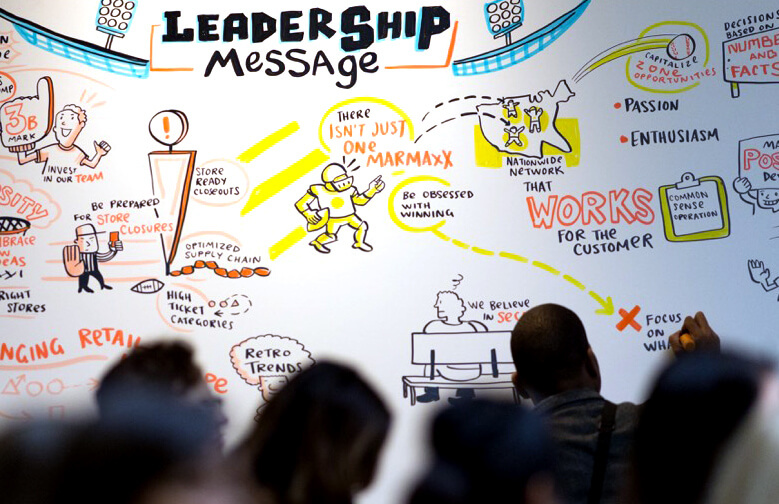 Whether you’re interested in what our graphic recording workshops have to offer, or want to learn more about visual note taking and what to look for when hiring a visual facilitator for your event, read on for the key skillsets we train for at ImageThink. Graphic recording requires an ability to listen for key ideas, and to synthesize them into words and images in real time. Graphic recording is much more than a pretty picture. While we always strive for a beautiful end result, the skillset at graphic facilitation’s foundation is an ability to listen carefully for key points, and to distill lengthy conversation into synthesized statements. That means turning attention one hundred percent towards the topic at hand; identifying recurring themes; and using context clues from speaker intonation to audience response to understand when a comment is especially important for visual note taking. Visual hierarchies use text size, color, images and containers to delineate essential information and supporting points visual note taking. A skilled graphic facilitator doesn’t simply list out your presentation in bullet points. Visual hierarchy–including composition, variation in text size, and the use of color to denote key words–organizes visual note taking in a way that makes them readable at a glance. Experienced graphic recorders use visual cues to indicate the flow of information, so that related ideas are visibly connected, and the through-line of conversation and graphic facilitation can be easily followed by a viewer. Color, text size, and placement of images on the board allows viewers to read essential information and supporting points almost instantly. Visual metaphors take mind-mapping to the next level, couching information in imagery that is both informative and exciting to look at. Graphic recorders are experts at connecting the dots between concepts–and at visualizing those connections for others to see in their visual note taking. Mind-mapping is a baseline technique for illustrating the relation between pieces of content, and for the way in which new concepts branch off one another. At ImageThink, we also like to use visual metaphors like landscapes in graphic recording, couching our visual notes in exciting and engaging ways that emphasize the links between ideas. Simplified imagery, like the drawing above, emphasizes the content of visual notes rather than distracting from them. ImageThink’s visual note taking vocabulary is similar to cartooning in its economy of line. While most of our graphic recorders have a background in illustration or fine art, it’s oftentimes better to use simplified imagery. Not only does highly rendered artwork take more time than is usually available during a live graphic recording session, it can also end up distracting from the content of the work rather than amplifying it. As a well organized board clearly and successfully conveys the key messages of the speaker, it’s sometimes best to use clear and bold imagery. Learn more about graphic recording and visual note taking! Our customized graphic recording workshops give your team practical visual tools to enhance creativity and collaboration. With over twenty years of experience, our co-founders Nora Herting and Heather Willems will get your team out of their seats and in front of the drawing board with interactive exercises in design thinking, to workshop ideas in graphic facilitation, and creative problem solving.